Take a pan and add tomato puree, water, ginger, 1/2 teaspoon of salt and let it come to boil. Add soya nuggets and cook it for 5-7 minutes till it is totally cooked. Till then it will soak almost all the water. Let it cool slightly. Add onions, green chillies, garam masala, chat masala and blend this all well with the water in batches. Take it out in a bowl. Add salt(be careful as salt is also added while boiling soya nuggets), rice flour, rava, coriander leaves and mix it well. If it is too soft you can add little more rava. Mix and knead into a soft dough. Take appam maker and grease it with oil. Make small balls and put it into appam maker, close the lid and cook on one side for about 3-4 minutes and then turning it on the other side. Cook it on both the sides on a medium flame till it turns light brown. For curd - Take a bowl. Add curd, salt, sugar and mix it well. Keep it in the refrigerator to chill it. For serving- Take 4 bowls, arrange 3-4 soya patties. 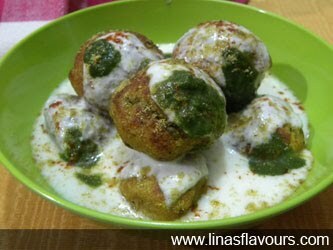 Pour curd on it, drizzle green chutney, cumin powder, red chilly powder and serve it. Note: You can also soak soya patties/balls in water for 4-5 minutes as we do for dahiwada.